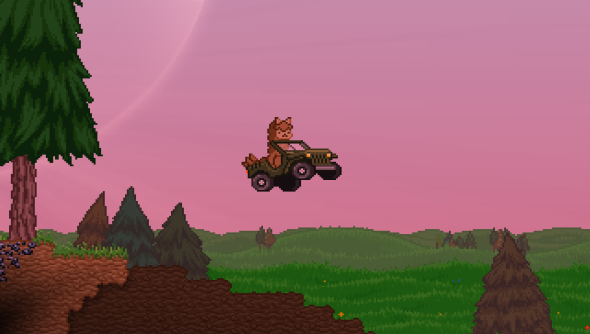 If you’ve ever seen an upbeat giraffe, no doubt your thinking has turned to starship upgrades, matter manipulators, and bug catching, making it an appropriate name for Starbound’s latest update which adds all those things. It’s the first stable update Chucklefish have released for Starbound since March last year and it changes just about everything in the procedurally generated universe explorer. The main change to how you play will likely come from the new outpost. It’s a new hub that’s filled with shops, quest givers, and other services. It’s where you can upgrade your ship with extra storage capacity and take on missions and quests that lead you into unique instanced dungeons packed with special monsters and bosses. These can be played in co-op. Having friends along with the ride will make things easier but you’ll have to split the rewards. Starbound’s combat’s been completely overhauled, too. You can now parry attacks, break enemies’ shields, and fight in full 360 degrees. There’s a stack of new content to explore with new biomes, items, over 100 new recipes. Hell, you can even go out with a net and start catching bugs to collect on your ship. Chucklefish suggest starting a new character after installing the update because “the game has changed so drastically that you’d miss out on most of the new content if you simply used an old character.” There’s a chance the team will release a conversion tool in the future but until then your old character will be unusable. I’ve copied in the full patch notes on the next page because there’s simply too much to go through to accurately summarise. Includes a Sign Store based on the popular Custom Signs mod, where players can design and print their own signage for use in game. Thanks Wellbot! Missions take place in unique instanced dungeons containing special monsters, bosses, and rewards not available anywhere else. Some missions can be quite difficult, so you’ll want to prepare carefully – or bring friends! New playable race with their own unique progression of armor sets, craftable guns and ship upgrades! Lots of new techs! Techs techs techs. It’s stopped sounding like a word now.